After dominating in exhibitions and in their season opener, the No. 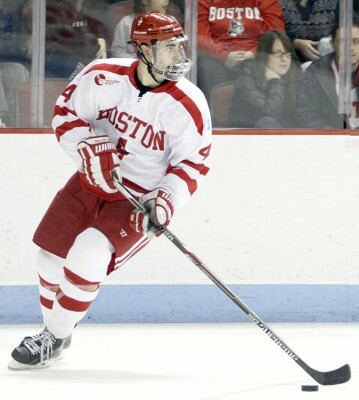 2 Boston University men’s hockey team failed to bounce back from a slow start in a 4-3 loss to No. 10 University of Denver Friday night at Magness Arena. The Terriers (1-1-0) came into the contest having defeated Colgate University by a score of 6-1 last weekend, but could not overcome an early three-goal deficit against an impressive Pioneers (1-2-0) team. Freshman netminder Jake Oettinger made 31 saves in his second collegiate start, while junior defenseman Brandon Hickey, sophomore forward Jordan Greenway, and freshman forward Clayton Keller found the back of the net for BU. The game started off at a fast pace, something that usually works in favor of the Terriers. However, the Pioneers were able to stay with their opponent, and eventually able to put pressure on the defense and on Oettinger in net. In just the first nine minutes of the game, the 6-foot-4, 205 pound ‘tender made eight saves. The main reason the Pioneers were able to get so many looks was due to BU’s four penalties in the opening frame. Denver would finally score on their third power play, as Matt Marcinew tipped in teammate Will Butcher’s slapshot to give the Terriers it’s first deficit of the young season. Coach Quinn has stressed cutting down on his team’s penalty minutes ever since the first exhibition versus the University of Prince Edward Island on Oct. 1. The four penalties in the opening period allowed Denver to control the game and the shot count, taking 14 shots in the period to the BU’s nine. The Pioneers would wind up leading the final shot count, 35-26. The Pioneers didn’t let up in the second period, scoring two goals in the first five minutes of the period to put BU in a 3-0 hole. After Denver forward Evan Janssen got behind the defense and beat Oettinger with ease with 15:16 left in the second period, Quinn immediately called timeout to gather his players and try to create a spark. At first, Quinn’s timeout proved efficient, as BU took the ice with a little extra energy. That translated to a power play goal from Hickey, whose quick one-timer from the top of the left circle snuck past Denver’s Tanner Jaillet. It was the first goal by a Terrier blue-liner this season. Unfortunately, BU was unable to hold the momentum, as Janssen got the puck at the left slot and beat Oettinger top left. Just like that, the Terriers were back down three, and failed to cut into that deficit by the end of the second period. In the third period, the Terriers started off much better, as evident by Greenway’s goal at the beginning of the frame. The second-line forward managed to poke in the puck while in a scrum in front of the net to make things interesting. Then, with 9:10 remaining in the contest, Keller got the puck on a breakaway and showed why he was a top pick in this year’s NHL Draft with a great move to beat Jaillet. Suddenly, the Terriers had the momentum, and there was plenty of time left to tie it up. Quinn pulled Oettinger with 1:22 left in the period, but BU was simply unable to convert with the extra-man advantage. Hickey had a chance for his second goal after a shot attempt ricocheted off of Jaillet and to his right, but Hickey couldn’t corral the rebound and Denver was able to knock it away. The Terriers will look to shake off Friday’s loss and get back in the win column when they take on the Pioneers on Saturday. BU will then return home for a pair of games versus Sacred Heart University and Quinnipiac University next weekend.